The crop has improved dramatically over the last two weeks. 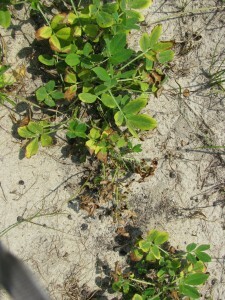 Some of the early planted peanuts are beginning to lap the middles and are blooming well. Although the majority of the South Carolina peanut crop is doing well so far, growers are still having germination/stand problems with a few of the late planted runner varieties. 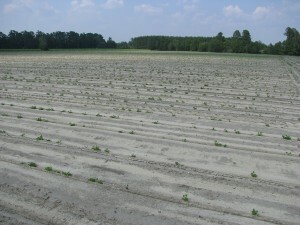 Some growers were able to replant while others either could not get seed or have run out of time. 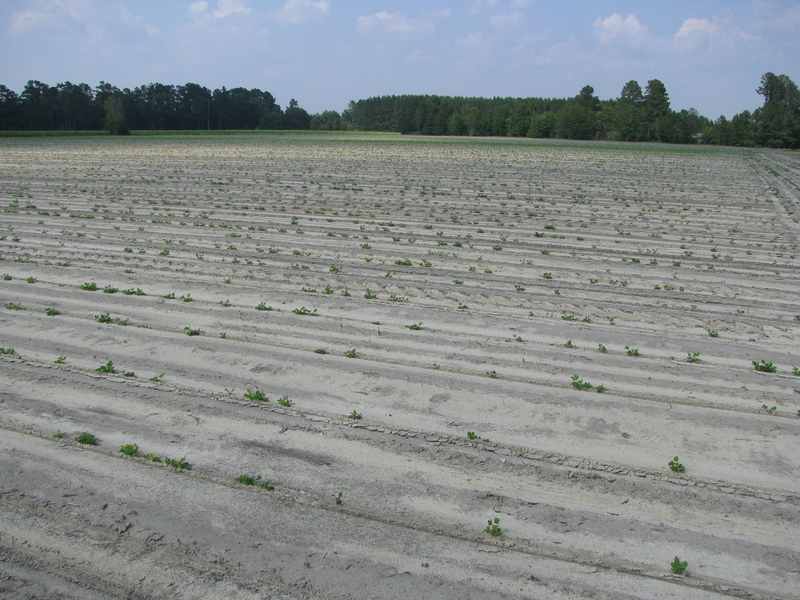 This might have been one of the longest planting seasons for South Carolina growers in several years with peanuts being planted from Mid-April to Mid-June. In addition to late season planting issues, Mother Nature also played a hand in delaying early season weed control and gypsum applications for many of our growers. Fortunately, the improved conditions have allowed growers to get back in the fields and slowly catch up. I have really enjoyed getting out and visiting with several growers throughout the state. Please call me if I can help in any way. Fungicide programs should have been initiated for leafspot and soilborne disease control. Conditions for disease development and spread are favorable for both types of disease. For fields with known leafspot and moderate white mold problems, consider using one of the systemic leafspot fungicides in either the 45DAP (Tilt) or 60 DAP (Headline, Provost, Abound, etc). This will help get a start managing any leafspot disease that might develope as a result of the rainy conditions. Remember that some leafspot fungicides are not as effective on soilborne disease. You might need to add tebuconazole or Convoy. Please see page 47 of the 2012 Peanut Money Maker for more detailed information. Please see label to determine the correct rate as many products have different concentrations. At 45-60 DAP, is when you can determine if you have an inoculant failure. An average of 15 large nodules per taproot at 45 DAP is considered good; less than 10 per taproot is marginal and less than 5 indicates poor inoculation. Make sure to check labels for Pre-harvest intervals. 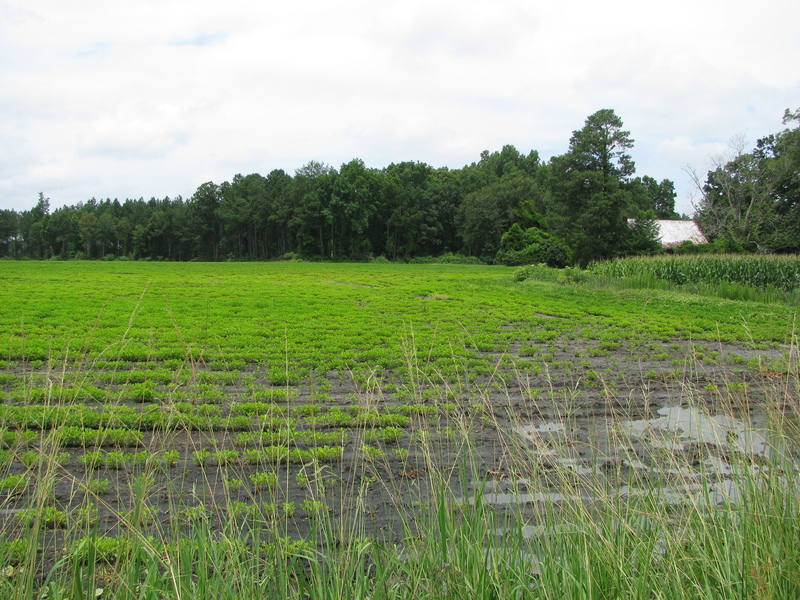 To help answer questions received over the last few weeks regarding tank mixtures, I have added some information from a talk David Jordan, NC State Peanut Specialist, gave at our state peanut meeting back in January. I hope this helps. Below are a few pictures taken during my last trip through the state. I will showcase more positive things in the next issue.